Surfing, Yoga & Paradise…Costa Rica awaits you! Want to get away from the real world for a bit? Feel the need to explore a new country (or re-visit an old favorite)? Ready to feel the restorative qualities of yoga? Ready to see what paradise is REALLY like? Join us in Costa Rica!!! For over a decade we have packed our bags and traveled to Costa Rica for the surf and yoga retreat of a lifetime! 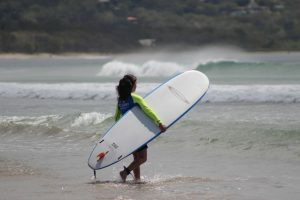 This unique, learn-to-surf or just go surfing adventure takes place in beautiful Playa Grande Costa Rica, which is a surfing oasis. 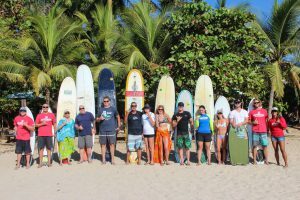 Playa Grande provides our clients with a worry-free surf/yoga retreat facilitated by our team of certified instructors. The best part, however…the tropical climate of Costa Rica provides year-round water temps around 80 degrees. No wetsuit is required! Perfect conditions set up across Playa Grande with glassy waves peeling up and down the beach. Enjoy not only smiles and laughs, but also plenty of waves as we soak up the warm water during our first morning session. Our instructors work with each individual, establishing and providing a foundation for lifelong surfing skills. Click HERE for more info and to enroll!